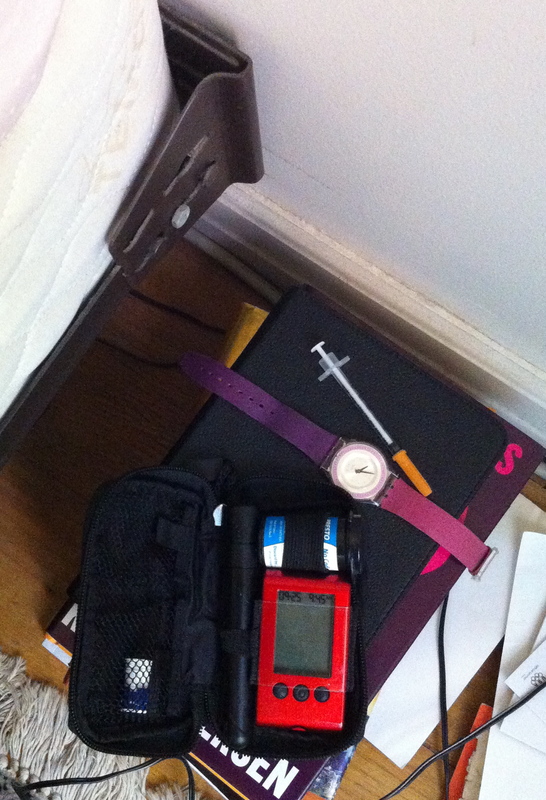 Every night before I go to sleep I check my blood sugar. Every night, without exception for the past few years – until last night. If you read my last post you know I came back from my vacation to the Netherlands on crutches. I have a sprained ankle that is mending slowly, very slowly, and taking more of my energy – physical and mental – than I realize, and then I would normally allow. Tis true I can hobble around in my soft foam boot cast in the house, but no more than a few blocks outside my apt, and then on crutches along with the cast. Last night I could barely crawl into bed an hour before my usual bedtime and 15 minutes later the magazine I was reading dropped on my chest and woke me up. At which point I realized it was time to turn off my reading light. Knowing I should check my blood sugar, having moved my meter into the bedroom to keep at the foot of my bed so I can check before I go to sleep and first thing in the morning, I knew I only had to reach down and take a few minutes to prop it on the bed and check. But while my mind said, “Do it!” my spirit wasn’t willing. My spirit in fact said, “F#%K this S&*T! Why do I have to be constantly, rigorously so well behaved? !” This time I’m going to trust I’ll get through the night or wake up if I’m low. And if not, well, I tried. Must have been the exhaustion talking. Obviously you know I got through the night. I even awoke to a very satisfying 85 mg/dl. But this excursion in not doing my usual diabetes task made me realize how many tasks I do, and how I do them without question; they have just become part of how I live, quick and perfunctory habits. This post is not about stopping doing the things we do to keep ourselves safe and well, but rather giving ourselves a pat on the back for all we do. When diabetes tasks become habits, which is great so they take less time and effort, they can also go unseen. In that we don’t see the effort they take anymore, the care we give ourselves. That is good for the doing of our tasks, but it’s also good to step back and congratulate ourselves for all we do. Tonight I’m sure I’ll check my blood sugar before I go to sleep. Maybe I’ll also smile while doing it knowing I have a lot to be proud of, how I work at managing my diabetes, and that I have a lot to be grateful for: the warm bed I’ll be in, the tools I need to check my blood sugar before I fall asleep, and those I need to get through each day. I’ll also know now and then when the spirit moves me, it’s OK to give myself a break. Hopefully, I won’t always need a bodily break to remind me or wear a physical boot to remind me when it’s time to reboot my energy.